The authorities in the United Arab Emirates (UAE) should reveal the whereabouts of prominent human rights defender and citizen-journalist Ahmed Mansoor and release him immediately and unconditionally, over two dozen human rights organisations said today. He is being held for his peaceful human rights work. 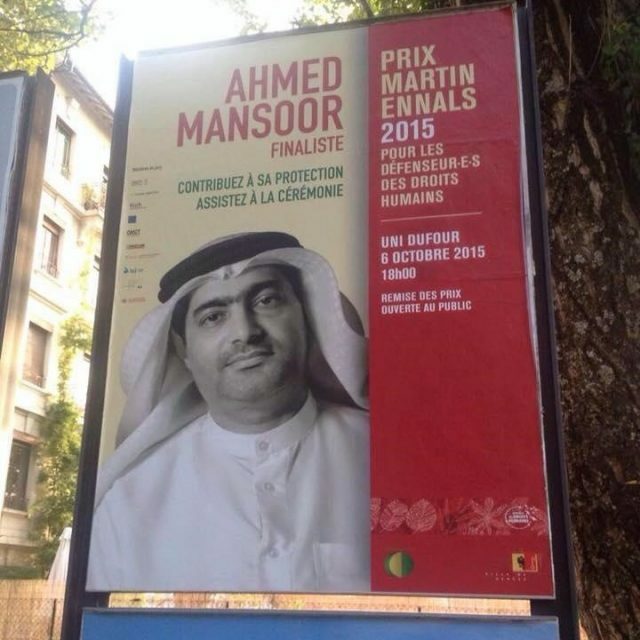 March 20, 2018 marks one year since security forces arbitrarily arrested Mansoor, winner of the Martin Ennals Award for Human Rights Defenders in 2015, at his home in Ajman. The UAE authorities have continued to detain him in an unknown location, despite condemnation from UN human rights experts and independent human rights organisations. “The authorities have subjected Ahmed Mansoor to enforced disappearance since his wife last saw him in September 2017. They must reveal his whereabouts to his family and grant him regular access to them and to a lawyer of his choosing,” said Khalid Ibrahim, Executive Director of the Gulf Centre for Human Rights (GCHR). “Mansoor’s arbitrary detention is a violation of his right to freedom of expression and opinion. The UAE authorities must drop all charges against him and release him immediately,” said Carles Torner, Executive Director of PEN International. Since his arrest, Mansoor has not been allowed to make telephone calls to his family and has been allowed only two short visits with his wife, on April 3 and September 17, 2017, both under strict supervision. He was brought from an unknown place of detention to the State Security Prosecutor’s office in Abu Dhabi for both visits. The authorities have refused to inform his family about his place of detention and have ignored their requests for further visits. In February 2018, a group of international human rights organisations commissioned two lawyers from Ireland to travel to Abu Dhabi to seek access to Mansoor. The UAE authorities gave the lawyers conflicting information about Mansoor’s whereabouts. The Interior Ministry, the official body responsible for prisons and prisoners, denied any knowledge of his whereabouts and referred the lawyers to the police. The police also said they had no information about his whereabouts. The lawyers also visited Al-Wathba Prison in Abu Dhabi following statements made by the authorities after Mansoor’s arrest, which suggested that he was held being held there. However, the prison authorities told the lawyers there was nobody matching Mansoor’s description in the prison. “Instead of protecting Mansoor, the authorities have detained him for a year with hardly any access to his family and no access to a lawyer of his choosing. Their contempt for human rights defenders and brazen disregard for their obligations under international human rights law is truly shocking,” said Sima Watling, UAE Researcher at Amnesty International’s Middle East Regional Office. A dozen security officers arrested Mansoor at his home in Ajman in the pre-dawn hours of March 20, 2017 and took him to an undisclosed location. The security officials conducted an extensive search of his home and took away all of the family’s mobile phones and laptops, including those belonging to his young children. 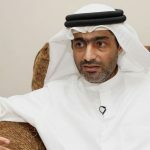 The authorities refused to disclose any information about Mansoor to his family, who had no information about him until a statement was issued on the Foreign Affairs Ministry’s website on March 29, 2017 claiming that he was in detention in the Central Prison, also known as Al-Wathba, in Abu Dhabi. But the authorities have failed to confirm his place of detention to his family. Since his arrest, according to informed sources, Mansoor is believed to have been held in solitary confinement without any access to a lawyer of his choosing. Prolonged and indefinite solitary confinement can amount to torture or other cruel, inhumane, or degrading treatment under international human rights law. Human rights organisations have also received reports from informed sources that Mansoor may be being subjected to other forms of torture or ill-treatment in detention. The statement classified these as “cybercrimes,” indicating that the charges against him may be based on alleged violations of the UAE’s repressive 2012 cybercrime law, which authorities have used to imprison numerous activists and which provides for long prison sentences and severe financial penalties. In the weeks leading up to his arrest, Mansoor had used Twitter to call for the release of the human rights activist Osama Al-Najjar, who remains in prison despite having completed a three-year prison sentence in March 2017 for his peaceful activities on Twitter; as well as the release of prominent academic and economist Dr Nasser bin Ghaith, sentenced in March 2017 to 10 years for his Twitter posts. Mansoor had also used his Twitter account to draw attention to human rights violations across the Middle East region, including in Egypt and Yemen. He had also signed a joint letter with other activists in the region calling on Arab League leaders, meeting in Jordan in March 2017 for the Arab Summit, to release political prisoners in their countries. He also has a blog, which he used to write on various topics, including articles about the human rights violations that he is subjected to because of his peaceful activities, as well as about the situation of freedom of expression and prisoners of conscience in the UAE. Mansoor is a member of GCHR’s Advisory Board and a member of the advisory committee of Human Rights Watch’s Middle East and North Africa Division. The mission to locate Mansoor was sponsored by GCHR, the Martin Ennals Foundation, Front Line Defenders, the International Service for Human Rights (ISHR), as well as FIDH and the World Organisation Against Torture (OMCT), under their partnership, the Observatory for the Protection of Human Rights Defenders. Pending his release, ensure that he is treated in line with the UN Standard Minimum Rules for the Treatment of Prisoners, including by giving him regular access to his family and a lawyer of his choosing, as well as to any medical care he may require. ينبغي على السلطات في الإمارات العربية المتحدة الكشف عن مكان المدافع البارز عن حقوق الإنسان والصحفي أحمد منصور وإطلاق سراحه فوراً وبلا قيد أو شرط، وفقاً لما ذكرته أكثر من عشرين منظمة لحقوق الإنسان اليوم. وهو محتجز بسبب عمله السلمي في مجال حقوق الإنسان. يصادف 20 مارس/آذار 2018 مرور عام منذ أن اعتقلت قوات الأمن منصور بشكل تعسفي، وهو الفائز بجائزة مارتن إنالز للمدافعين عن حقوق الإنسان في عام 2015، في منزله في عجمان. استمرت السلطات الإماراتية في احتجازه في مكان مجهول، رغم إدانة خبراء الأمم المتحدة في مجال حقوق الإنسان ومنظمات حقوق الإنسان المستقلة. بعد اعتقاله في 20 مارس/آذار 2017 ، أعلنت السلطات أنه يواجه اتهامات تتعلق بخطابه من ضمنها استخدام مواقع التواصل الاجتماعي “لنشر معلومات كاذبة تضر بالوحدة الوطنية”. ومنذ اعتقاله ، لم يُسمح لمنصور بإجراء مكالمات هاتفية مع أسرته، ولم يُسمح له سوى بزيارتين قصيرتين مع زوجته في 3 أبريل/نيسان و17 سبتمبر/أيلول، وجرى كلاهما تحت إشراف صارم. وقد أحضروه من مكان احتجازه غير المعروف إلى مكتب المدعي العام في أبو ظبي للزيارتين. رفضت السلطات إبلاغ عائلته بمكان احتجازه وتجاهلت طلباتهم للقيام بمزيد من الزيارات. في فبراير/شباط 2018، قامت مجموعة من منظمات حقوق الإنسان الدولية بتكليف محامييْن من أيرلندا بالسفر إلى أبوظبي من أجل الوصول إلى منصور. أعطت السلطات الإماراتية للمحامييْن معلومات متضاربة حول مكان وجود منصور. ونفت وزارة الداخلية، وهي السلطة التي تسيطر على السجون وتديرها، أي معرفة بمكان وجوده وأحالت المحامييْن إلى الشرطة. كما قالت الشرطة إنها لا تملك أي معلومات عن مكان وجوده. زار المحامييْن أيضاً سجن الوثبة في أبو ظبي بعد التصريحات التي أدلت بها السلطات عقب اعتقال منصور والتي أشارت إلى احتجازه هناك. ومع ذلك ، فقد أبلغت سلطات السجن المحامييْن بأنه لا يوجد أحد يماثل وصف منصور في السجن. ألقي عشرة من قوات الأمن القبض على منصور من منزله في عجمان قبل الفجر بساعات يوم ٢٠ مارس/آذار 2017 واقتادوه إلى مكانٍ غير معلوم. أجرى المسؤولون الأمنيون تفتيشاً مكثفاً داخل منزله وأخذوا جميع الهواتف المحمولة والحواسيب الخاصة بالأسرة، بما في ذلك تلك التي تخص أطفاله الصغار. رفضت السلطات الإفصاح عن أي معلومات حول منصور لأسرته التي لم يكن لديها أي معلومات عنه حتى صدور بيان على الموقع الإلكتروني لوزارة الخارجية في ٢٩ مارس/آذار 2017 أعلن إنه محتجز بالسجن المركزي المعروف أيضاً بسجن الوثبة في أبو ظبي. لكن السلطات لم تؤكد مكان احتجازه لأسرته. ومنذ اعتقاله، وفقاً لمصادر مطلعة، يُعتقد أن منصور محتجز في الحبس الانفرادي دون أي اتصال بمحام من اختياره. يمكن أن يكون الحبس الانفرادي المطول وغير المحدود بمثابة تعذيب أو غيره من ضروب المعاملة القاسية أو اللاإنسانية أو المهينة بموجب القانون الدولي لحقوق الإنسان. كما تلقت منظمات حقوق الإنسان تقارير من مصادر مطلعة مفادها أن منصور قد يتعرض لأشكال أخرى من التعذيب أو سوء المعاملة في السجن. صنف البيان هذه التهم على أنها “جرائم إلكترونية”، مشيراً إلى أن التهم الموجهة ضده قد تكون استناداً إلى انتهاكات مزعومة لقانون مكافحة الجرائم الإلكترونية لعام ٢٠١٢ القمعي والذي استخدمته السلطات في سجن العديد من النشطاء، والذي ينص على أحكام بالسجن طويلة وعقوبات مالية شديدة. في الأسابيع التي سبقت اعتقاله، استخدم منصور تويتر للدعوة إلى إطلاق سراح الناشط أسامة النجار، الذي لا يزال في السجن، على الرغم من أنه قد أنهى عقوبة السجن لمدة ثلاث سنوات في مارس/آذار 2017 بسبب أنشطته السلمية على تويتر، فضلاً عن الأكاديمي والناقد البارز الدكتور ناصر بن غيث، الذي اعتقل في أغسطس/آب ٢٠١٥ وحكم عليه بالسجن لمدة ١٠ سنوات بسبب تغريداته على تويتر. استخدم منصور أيضاً حسابه على تويتر للفت الانتباه إلى إنتهاكات حقوق الإنسان في جميع أنحاء المنطقة، بما في ذلك مصر واليمن. ووقع أيضاً رسالة مشتركة مع نشطاء آخرين في المنطقة يطالبون القادة في القمة العربية الذين اجتمعوا في الأردن في مارس/آذار 2017 بالإفراج عن السجناء السياسيين في بلدانهم. لديه أيضا مدونة كان يكتب فيها عن مواضيع مختلفة، بما في ذلك مقالات عن انتهاكات حقوق الإنسان التي يتعرض لها بسبب أنشطته السلمية، وكذلك حول حالة حرية التعبير وسجناء الرأي في دولة الإمارات العربية المتحدة. منصور هو عضو المجلس الاستشاري لمركز الخليج لحقوق الإنسان وعضو اللجنة الاستشارية لقسم الشرق الأوسط وشمال أفريقيا في منظمة هيومن رايتس ووتش. كانت مهمة تحديد مكان منصور تحت رعاية كل من: مركز الخليج لحقوق الإنسان، مؤسسة مارتن إنالز، فرونت لاين ديفندرز، الخدمة الدولية لحقوق الإنسان، وكذلك الفدرالية الدولية لحقوق الإنسان، المنظمة العالمية لمناهضة التعذيب، وشركائهم، ومرصد حماية المدافعين عن حقوق الإنسان. إلى حين الإفراج عنه، التأكد من أنه يتم التعامل معه بما يتماشى مع القواعد النموذجية الأدنى للأمم المتحدة لمعاملة السجناء، بما في ذلك منحه إمكانية الوصول بانتظام إلى أسرته ومحام من اختياره، فضلاً عن أي رعاية طبية قد يحتاجها.